FIBARO Flood Sensor is a universal, Z-Wave compatible, flood and temperature sensor. Device can be battery or VDC powered. Flood alarm is sent to the Z-Wave network devices or additionally to any alarm system controller, through opening a NC contact. The device has built in temperature sensor, monitoring temperature of e.g. floor. 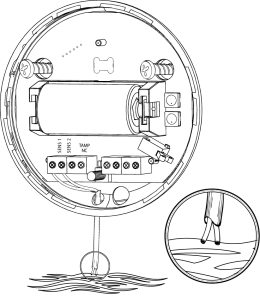 Flood Sensor is designed to be placed on the floor or on a wall with a flood sensor probe extended by connected wire. The device has built in visual LED indicator and acoustic alarm. LED diode signals flood, operating mode or the Z-Wave network communication range. In addition, the sensor is equipped with a tilt sensor reporting tilt or movement to the main controller e.g. when someone has taken the Sensor from its original location. FIBARO Flood Sensor is sink-proof, which means it drifts on the water surface and keeps on sending alarm signal in case of substantial inundation of water. Two operating modes – flood/temperature sensor or just a temperature sensor. This product is intended to be supplied by a certified Power Supply Unit marked “Class 2” or “LPS” and rated from 12V DC to 24V DC. By default, Flood Sensor’s insensitivity is set to 1 second, which means flooding will be reported one second after it’s been detected. Tilt tamper is insensitive to little vibrations and turns. After its activation, insensitivity is turned off for 15 seconds. After that, each Sensor’s movement will trigger audible alarm, consisting of 3 acoustic signals. Version 2.6 has introduced the functionality of cancelling the tamper alarm after 10 seconds. During this time, both sources of tampering (movements and cover) must remain intact to cancel the alarm. Turn the cover counter-clockwise and open it. Flood Sensor will confirm being powered with a short beep. Add the device (see “Adding to the network”). Close the cover and turn it clockwise. Place the sensor onto a surface prone to flooding. Three electrodes underneath the device should evenly touch the surface. After completing installation it is recommended to test sensor’s operation by placing the entire sensor or its probes’ extension wire onto water surface. Place the Flood Sensor only on non-conductive surfaces. When changing the Sensor’s location, it’s recommended to wake up the device and reconfigure the Z-Wave network by triple clicking the TMP button. 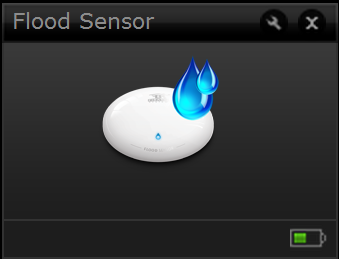 There are two powering modes for the FIBARO Flood Sensor. By default it is powered by a factory included battery. In addition it can work with a constant voltage, after connecting a 12/24 VDC power supply to +12 and GND terminals). Powering mode configuration is carried out automatically, while a sensor is being added into the Z-Wave network. When battery powered, a FIBARO Flood Sensor communicates with a Z-Wave network main controller periodically. Detected alarms are sent immediately, but configuration parameters and associations settings only at specified wake up intervals, or at a manual wake up (TMP button click). In DC powering mode, configuration and associations parameters are sent when necessary, and in addition a sensor serves as a Z-Wave signal repeater. In constant powering mode a sensor may operate without a battery. Installing a battery is recommended though, as it will serve as an emergency power source. When constant power fails, sensor will automatically shift to an backup power mode. All reports, including flood and temperature, will be sent immediately, but it will not be possible to modify the configuration or association settings until constant power returns. If a sensor served as a signal repeater for other Z-Wave devices, in emergency mode signal repeating function will be deactivated. FIBARO Flood Sensor will automatically exit emergency mode once 12/24 VDC at +12 and GND terminals is detected. FIBARO Flood Sensor’s battery life is ca. 2 years at factory default settings. The current battery level is displayed in a Z-Wave controller interface. Red battery icon means a battery needs replacement. 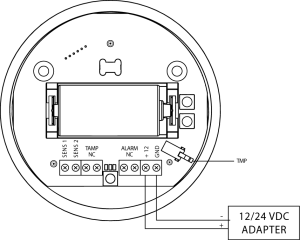 In order to avoid triggering tamper alarm while replacing the battery, 4th (2nd for 2.6 or lower) association group’s associations must be deleted, and Sensor’s parameters’ configuration set to default. 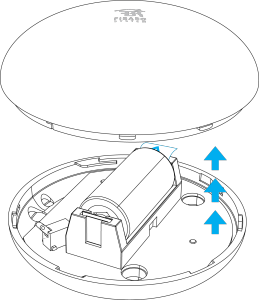 Connecting the FIBARO Flood Sensor in a manner inconsistent with manual may cause risk to health, life or material damage. Remember to keep the device away from water or protect holes for wires from water to avoid destroying the device. Tamper contact for 2nd Association Group. When a sensor is added to the Z-Wave network, cover open alarm may be activated. Connect while observing wiring diagram shown in this manual only. Incorrect wiring may be dangerous or result in the device breakdown. ALARM NC and TAMP NC connectors may be used as end-of-line protective loop’s terminals. If you want the device to be mounted on a wall or in a distance from flooding source, sensor should be extended using an external probe (not included). We recommend using extension probes or cables designed to detect water. Probes ends should be coated with non-corrosive metal. Connection wires should not be longer than 3m and thicker than 18AWG (0.82mm2). Contacts SENS1 and SENS2 are dedicated to flood detection only. Do not connect external voltage! 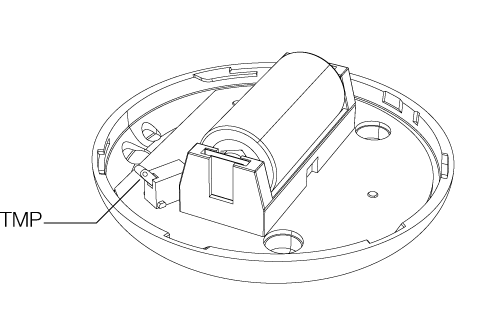 Mounting screws shown in a diagram are not included in the package. Choose a screw type depending on the building material it is being attached to. 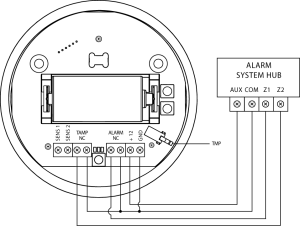 The Sensor detects resistance between electrodes 1 and 3, 1 and 2 and electrodes connected to contacts (SENS1 and SENS2). Place the Flood Sensor within the direct range of your Z-Wave controller. Set the main controller in add mode (see the controller’s manual). Quickly, three times press the TMP button. FIBARO Flood Sensor has a built-in Z-Wave network main controller’s range tester. Press and hold the TMP button until the visual indicator glows violet. Press the TMP button again, briefly. To exit Z-Wave range test, press the TMP button briefly. Visual indicator pulsing green – Flood Sensor attempts to establish a direct communication with the main controller. If a direct communication attempt fails, the device will try to establish a routed communication, through other modules, which will be signalled by visual indicator pulsing yellow. Visual indicator glowing green – Flood Sensor communicates with the main controller directly. Visual indicator pulsing yellow – Flood Sensor tries to establish a routed communication with the main controller through other modules (repeaters). Visual indicator glowing yellow – Flood Sensor communicates with the main controller through the other modules. After 2 seconds the device will retry to establish a direct communication with the main controller, which will be signalled with visual indicator pulsing green. Visual indicator pulsing violet – Flood Sensor does communicate at the maximum distance of the Z-Wave network. If connection proves successful it will be confirmed with a yellow glow. It is not recommended to use the device at the range limit. Visual indicator glowing red – Flood Sensor is not able to connect to the main controller directly or through another Z-Wave network device (repeater). 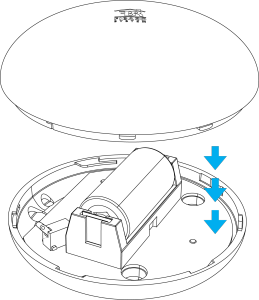 Communication mode of the Flood Sensor may switch between direct and one using routing, especially if the device is on the limit of the direct range. Holding: enter/navigate through menu (confirmed by the visual indicator). FIBARO Flood Sensor is equipped with a LED diode, signalling sensor’s operating modes and alarms. In addition the visual indicator may inform of the Z-Wave network range and the current temperature. Flood alarm is signalled with alternating white and blue light. In battery powering mode, with parameter no. 63 set to 1, visual indicator will periodically show temperature readouts (depending on parameters 50, 51, 61 and 62 settings). In constant powering mode, the current temperature readouts will be continuously signalled with a colour depending on the parameters 50, 51, 61 and 62 settings. Currently chosen MENU position is signalled with an illumination colour. FIBARO Flood Sensor is equipped with the MENU providing direct control over the device. Press and hold the TMP button for at least 3 seconds to enter MENU. Release the TMP button to choose the desired function and confirm your choice with the TMP button click. When in battery mode FIBARO Flood Sensor needs to be woken up to receive information about the new configuration from the controller, like parameters and associations. 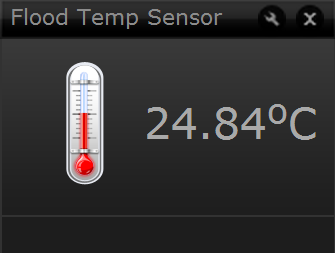 FIBARO Flood Sensor has two sensors built in – flood and temperature sensors, meaning it’s a multichannel device. In the Home Center controller the Sensor will be shown as two devices. 2nd Association Group – “Flood Control” devices in this group will be switched on or off when flood status changes (done via BASIC SET command frames). 3rd Association Group – “Flood Alarm” is assigned to the device status – devices in this group will receive notification about flood detection or cancellation. Useful for devices that can trigger alarms. 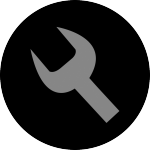 4th Association Group – “Tamper Alarm” is assigned to the TMP button and tilt sensor – devices in this group will receive a notification when the sensor is moved or the cover is taken off (which normally holds the button). Useful for devices that can trigger alarms. Functionality can be altered by parameter 74. The Flood Sensor in 2nd to 4th group allows to control up to 5 regular and 5 multichannel devices per an association group, with the exception of “LifeLine” that is reserved solely for the controller and hence only 1 node can be assigned. 1st Association Group is assigned to the device status – sending the BASIC SET (default) or ALARM control frame to the associated devices. 3rd Association Group reports the device status and allows for assigning single device only (the main controller by default – the device reports its status to the main controller). FIBARO Flood Sensor allows for controlling 5 regular and 5 multichannel devices per an association group, out of which 1 field is reserved for the Z-Wave network main controller. FIBARO Flood Sensor allows to customize its operation to user’s needs. The settings are available in the FIBARO interface as simple options that may be chosen by selecting the appropriate box. The Flood Sensor will wake up at each defined time interval and always try to connect with the main controller. After successful communication attempt, the sensor will update configuration parameters, associations and settings and then will go into standby mode. After failed communication attempt (eg. no Z-Wave range) the device will go into standby mode and retry to establish connection with the main controller after the next time interval. Setting wake up interval to 0 disables sending Wake Up notification to the controller automatically. Wake up may be still performed manually by a single TMP button click. Delays flood alarm cancelation for the device after flooding has ceased. Determines time period (in seconds) by which a Flood Sensor will retain the flood state after the flooding itself has ceased. The sensor will keep on reporting flooding to the main controller. This parameter setting does not affect acoustic and visual alarms, which turn off immediately after flooding ceases. This parameter allows for deactivation visual and acoustic alarm. Parameter allows for increasing a battery life. Setting changes will not affect the sensor’s communication with the main controller – commands to association groups, alarms and reports will still be sent. Determines the requested “on” level to be sent to devices from 2nd association group upon flood event. The value of 255 allows for turning a device on. In case of a Dimmer it means turning it on with the last memorized state, e.g. Dimmer set to 30% and turned off, turned on again using 255 command is turned on with last state i.e. 30%. Setting the parameter’s value to 0 disables sending these two commands to associated devices. This means that these devices WILL NOT be informed when the flooding has ceased. It is still possible to cancel alarms in 3rd association group by choosing second (green) menu position. Time interval (in seconds) between consecutive measurements of battery level and temperature (done by built-in temperature sensor). If the temperature differs from previously reported by a value determined in parameter 12, it will be reported to the Z-Wave controller. The parameter determines time interval, in seconds, at which a Flood Sensor measures and reports ambient temperature and battery level. If a temperature value will differ from previously reported by a value determined in parameter 12 (e.g. P12 = 50, i.e. temperatures differ by 0.5°C), new temperature value will be reported. If a battery level changes, the device will report a battery status change – Battery Report. In battery mode more significant battery level changes will be reported. Short time intervals mean more frequent communication, which results in shortened battery life. After consecutive FAILED and SUCCESSFUL communication attempts, the Sensor will go to standby mode. Determines a minimum temperature change value (insensitivity level), resulting in a temperature report being sent to the main controller, according to the Parameter 10 settings. The parameter stores a temperature value, below which visual indicator blinks with a colour determined by a parameter 61 settings. By default the visual indicator blinks blue. The main controller does not interpret negative numbers as decimals. That’s why read value may be different than entered. Negative numbers are coded in U2 standard. The parameter stores a temperature value, above which visual indicator blinks with a colour determined by the parameter 62 settings. By default the visual indicator blinks red. Parameter stores RGB colour value. A main controller interprets colours as a sum of it component colours value. Each colours value is a number from 0 to 255. 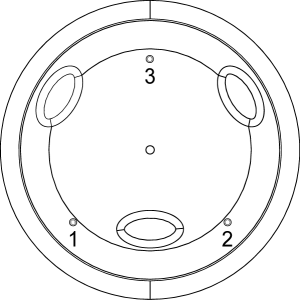 Parameter determines visual indicator’s operation. Setting to 0 turns the temperature LED indication off, saving battery life. Parameter stores a temperature value to be added to or deducted from the current temperature measured by internal temperature sensor in order to compensate the difference between air temperature and temperature at the floor level. The device is able to report tamper alarms resulting from sensor’s tilt/movement or TMP button state change (e.g. taking off the top cover). The device is capable of automatically turning off alarm signalization after a certain amount of time. Long lasting alarm may reduce battery life, when constantly signalized. The parameter determines time after which alarm will become “quiet” – still active but the device will go into battery saving mode. Visual or acoustic alarm will be reactivated after time specified in the parameter 76. When alarm status ceases, alarm will be turned off immediately. The value of 0 means visual and acoustic alarms are active indefinitely. In battery power mode the Sensor will never go to sleep which may shorten battery life significantly. The parameter is ignored when Parameter 2 is set to 0. Parameter determines a time period after which an alarm will be turned back on (in case it was turned off by parameter 75 setting). It will also resend commands to 2nd and 3rd association groups as if the alarm was detected again. In case a time period set in parameter 76 is shorter than the one specified in parameter 75, the device will not quiet the alarm, it will remain active. Allows to turn off the internal flood sensor. Tamper and built in temperature sensor will remain active. This parameter defines how commands are sent in specified association groups: as secure or non-secure. Parameter is active only in Z-Wave network security mode. It does not apply to 1st “Lifeline “group. FIBARO Flood Sensor will wake up at each defined time interval and always try to connect with the main controller. After successful communication attempt, a sensor will update configuration parameters, associations and settings, and then will go into standby mode. After failed communication attempt (eg. lack of Z-Wave range) the device will go into standby mode and retry to establish connection with the main controller after the next time interval. Setting wake up interval to 0 disables sending Wake Up Notification frame automatically. Wake up may be still performed manually by a triple TMP button click. Determines time period, in seconds, by which a Flood Sensor will retain the flood state after the flooding itself, has ceased. Sensor will keep on reporting flooding to the main controller. This parameter settings do not affect acoustic and visual alarms, which turn off immediately after flooding ceases. The parameter allows for LED indicator and acoustic alarm deactivation in case of flooding detection. Changes in this parameter settings allow for increasing a battery life. Settings changes will not affect the Sensors communication with the main controller – commands to association groups, alarms and reports will still be sent. The parameter determines a type of command frame sent by the Sensor in case flooding has been detected or cancelled. In case of alarm frames, alarm priority is determined. The value of 255 allows for turning a device on. In case of a Dimmer it means turning it on with the last memorized state, e.g. Dimmer set to 30% and turned off, turned on again using 255 command is turned on with last state i.e. 30%. Allows for deactivating device turn off and alarm cancellation functions for the devices assigned to 1-st association group (1 byte). Setting the parameter’s value to 0 results in stopping BASIC SET = 0 or ALARM WATER = 0 control frames from being sent. After sending flood alarm report the device will keep on reporting flooding after the flooding itself has ceased. Such a state can be cancelled by choosing alarm cancelation from the MENU, marked with green LED colour. Time interval, in seconds, between consecutive temperature measurements done by built in temperature sensor. New temperature value is reported to the main controller if it differs from the previously measured by hysteresis (defined in parameter 12). The parameter is relevant when using a Flood Sensor in a battery power mode – longer time interval means less frequent communication resulting in extended battery life. Value other than 0 means alarms are sent in BROADCAST mode (with a priority over other communicates), to all devices within the Flood Sensor’s range. The parameter stores a temperature value, below which LED indicator blinks with a colour determined by a Parameter 61 settings. By default the LED indicator blinks blue. The parameter stores a temperature value, above which LED indicator blinks with a colour determined by the Parameter 62 settings. By default the LED indicator blinks red. Parameter determines LED indicator’s operation. Set to 0 turns the indicator off, saving a battery life. The device is able to turn on alarms resulting from sensor’s vibrations e.g. when the sensor is moved, or the TMP button released. The user can silence the Flood Sensor. Because the Sensor’s alarm may last for a long time, it’s possible to turn off visual and audible alarm signaling to save battery. The parameter determines a time period after which alarm will become “quiet” – still active but the device will go into battery saving mode. Visual or acoustic alarm will be reactivated after time period specified in the Parameter 76. When alarm status ceases, alarm will be turned off immediately. Parameter determines a time period after which an alarm frame will be retransmitted. The value of 0 cancels an alarm frame retransmission. In case a time period set in this parameter is shorter than the one specified in parameter 75, the device will not quiet the alarm, it will remain active. Allows for turning of the internal flood sensor. Tamper and built in temperature sensor will remain active. 1. What is a Flood Sensor? FIBARO Flood Sensor is a universal, Z-Wave compatible, flood and temperature sensor. Device can be battery (ca. 2 years battery life) or VDC powered (12 or 24 VDC). Flood alarm is sent to the Z-Wave network devices or additionally to any alarm system controller, through opening a NC contact. It is designed to be placed on the floor or on the wall with a flood sensor probe extended by connected wire. The device has a built-in LED indicator and an acoustic alarm. In addition, the sensor is equipped with a tilt sensor. LED diode signals flood, operating mode or the Z-Wave network communication range. FIBARO Flood Sensor is sink-proof, it drifts on the water surface and keeps on sending alarm signal in case of substantial inundation of water. 2. How to arm or disarm the Sensor? FIBARO Flood Sensor is always armed when controlled by Home Center. 3. I have replaced the battery because FIBARO interface signaled its low state but I still see red, blinking battery icon. How to reset the battery level? The battery level report is sent at the same time as sensor’s wake up. You can wait a specified period of time or perform manual wake up by triple clicking the TMP button. 4. The widget is in an alarm state (small blue drops) after the inclusion. Why? The alarm state of the sensor is caused by tamper intrusion. 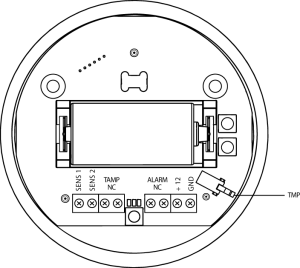 There are two sources of tamper – one from opening the case (triggering the Button – Tamper switch) and one movement/position tamper. You have to close the sensor cover, put the device away and wait for reconfiguration or wake up event (it can take up to 1.5 hours depending on configuration). 5. I have recently installed an electrovalve on my main water supply and wanted to associate FIBARO Flood Sensor with it but “Association” field in Advanced configuration is empty. What is the problem? Please reconfigure the device. It is not properly included. 6. Can I connect external voltage to SENS1 and SENS2 contacts? No, Contacts SENS1 and SENS2 are dedicated to flood detection only. 7. I changed the Sensor’s location. Do I need to do anything? When changing the Sensor’s location, it is recommended to wake up the device and reconfigure the Z-Wave network by triple clicking the TMP button. 8. I removed the battery and connected constant current power supply. Now the Sensor is invisible for the FIBARO system. Why? Powering mode configuration is carried out automatically, while the sensor is being included into the Z-Wave network. 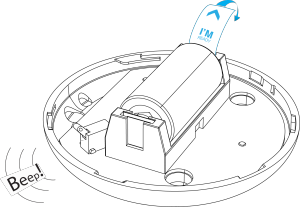 1) Exclude a sensor from the Z-Wave network. 3) Include the FIBARO Flood Sensor into the Z-Wave network. In constant powering mode the sensor may operate without a battery. Installing the battery is recommended though, as it will serve as an emergency power source. 9. What features, comparing to battery mode, Flood Sensor offers in DC powering mode? In DC powering mode the sensor does not require wake up, configuration and associations parameters are sent when necessary. In addition the sensor serves as a Z-Wave signal repeater. 10. May I switch powering modes freely? No, exclusion and re-inclusion are always necessary. 11. May the battery serve as an emergency power source? Yes, when constant power fails, sensor will automatically shift to an emergency mode. All reports, including flood and temperature, will be sent immediately, but it will not be possible to modify the configuration or association settings until constant power returns. 12. Is FIBARO Flood Sensor waterproof? Yes, the enclosure is waterproof, allowing for direct contact with a liquid and prevents submersion which would cease communication. 13. May the sensor be connected to an external flood probe? Yes, the external flood sensor contacts may be extended by connected wire. 14. Is it possible to easily check if the sensor has a good Z-Wave range and can communicate with the FIBARO System? Yes, FIBARO Flood Sensor has a built-in Z-Wave controller’s range tester. 15. Internal temperature sensor measures overstated temperature. Can I compensate it? Yes, parameter 73 stores a temperature value to be added to or deducted from the current temperature measured, compensating the difference between air temperature and temperature at the floor level. 16. How many devices can be associated with a Flood Sensor? 17. What is the Alarm Broadcast? Broadcast mode allows to send alarms to all devices within the FIBARO Flood Sensor’s range with a priority over other communications. 18. Can I turn off acoustic and visual signals? 19. There was a flood detection but the sensor still detects flooding. What should I do? You should edit parameter 1. It determines time period in seconds, by which a Flood Sensor will retain the flood state, after the flooding itself has ceased..
20. The Sensor reports tilt when it is moved accidentally. Can I turn off tilt sensor? Yes, just edit parameter 74 and change its value to 0.